At Tiger Custom Computers, we use our computers every single day for work and for play. We design and build our systems for responsiveness and reliability, processing power with room for upgrades, affordability and aesthetics. An upgrade which was long overdue, this particular system was built for my everyday computing needs as the owner of the business. I needed a system that could multitask well–beyond the usual internet, e-mail, and office productivity, I intended to use it for some pretty serious video and photo editing and even some gaming. Performance in Adobe Photoshop and Lightroom as well as raw processing power for video editing /encoding were of primary importance for some upcoming projects we are going to be pursuing at TCC. The Intel Core2Duo system I have had for the last four years has served me well and been extremely reliable. However, it no longer cut the mustard when it came to working with 20MP digital RAW photos or editing video. I opted for an Intel CPU because they have historically and currently outperform equivalent offerings from AMD when it comes to productivity in multimedia editing and file conversion. AMD would have been more affordable and would have more than suitable for ordinary computer usage and gaming, but I wanted exceptional performance when it came to the tasks which found my old system so sorely lacking. The Intel Sandybridge Core i7-2600K was a good value, and I was able to pair it with 16GB of Corsair XMS3 DDR3 RAM for less than $400. I decided to pair the 2600K and the gratuitous amount of RAM with an ASRock Z68 Gen3 motherboard–a platform that is full-featured, looks great, and was affordable. I could have opted for a more expensive motherboard, but I was fine with only two SATA 6Gb ports and rear-panel USB 3.0. I needed a case to put it all in, as I planned to retain my old system as a spare workstation. Also, despite being inexpensive and easy to work with, my Coolermaster CM690 was no longer up to our standards in terms of aesthetics. I did not feel it was representative of the nicer systems we build for our clients, and I wanted a system that was modern inside and out. 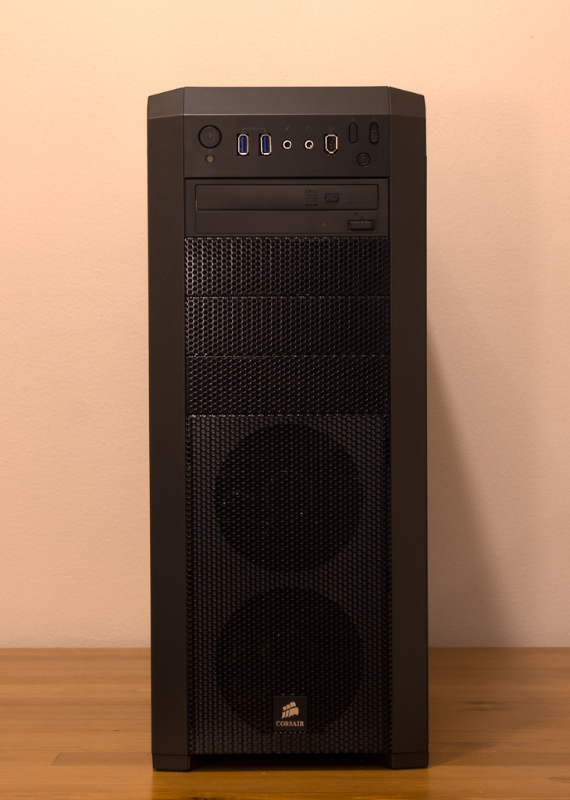 After looking at many reviews, photos, and video demos for various cases, I found the Corsair Carbide 500R. This case had more than enough room for my components, compatibility with various water-cooling components should I decide to go that route in the future, and it looks great. To top it off, I was able to find it for under $150 shipped. 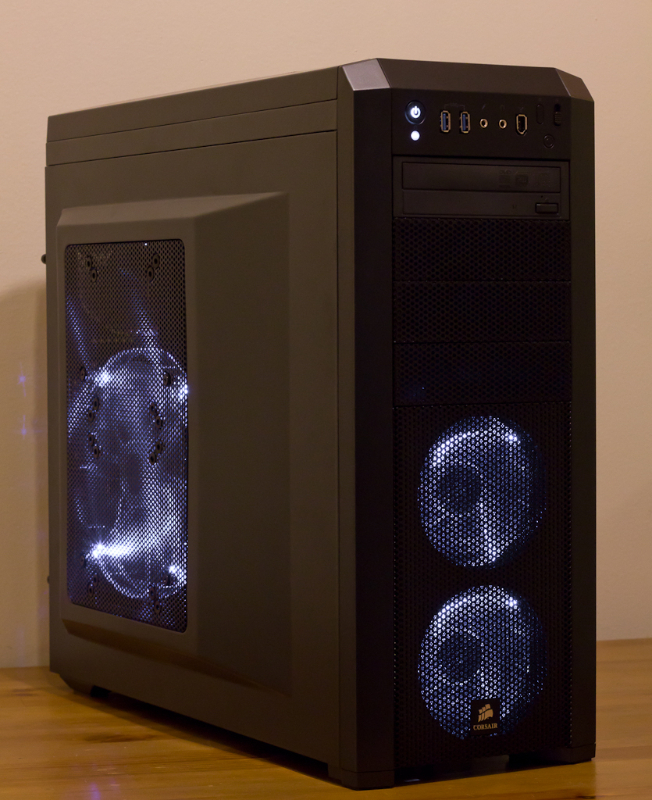 It has several LED fans that are a bluish-white, but they look great and the LED lights can be turned off with a button on the front panel of the case. 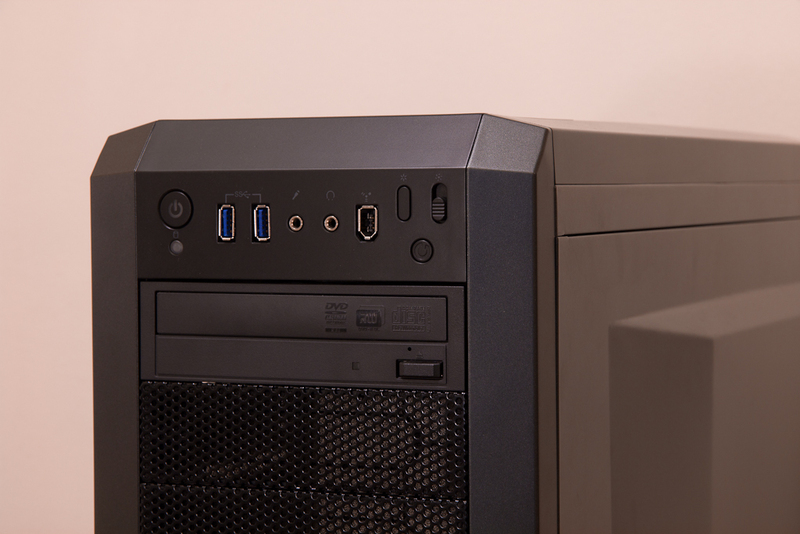 You can also control the case fan speeds from that same front panel, which is always nice. The case is mostly tool-less, but I always like to tighten any thumbscrews with an actual screwdriver so that nothing winds up coming loose. 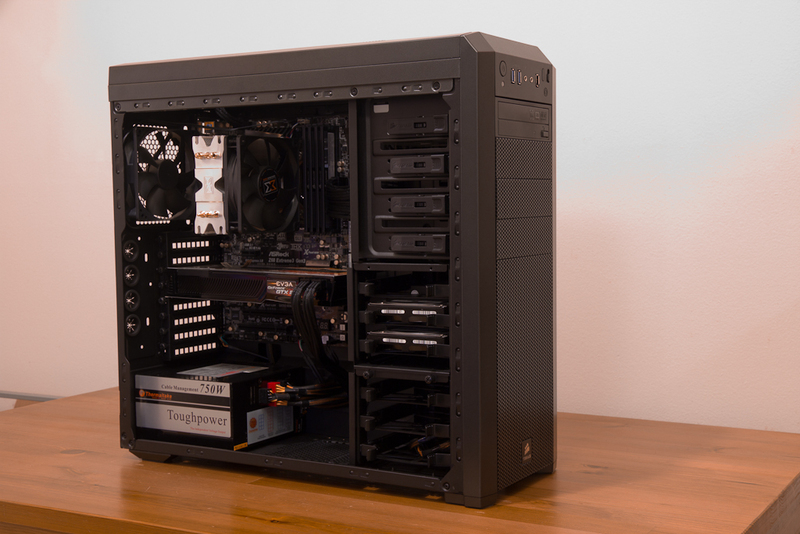 The Corsair Carbide 500R has plenty of cabling management features–ample room behind the motherboard tray to run power supply cables, rubber grommet-lined cutouts to route said cables through, and an organized layout which is conducive to a clean, finished look. I installed sleeved cable extensions to give the build even tighter aesthetics. I brought over the OCZ Vertex Solid State Drive, 750W Thermaltake modular power supply, EVGA GeForce GTX 260 and dual 1TB 7200RPM Samsung hard drives from my original rig, but installed a fresh copy of Windows 7 64-bit. For a CPU cooler, I purchased and installed a Xigmatek Gaia heatsink–I originally bought it due to how inexpensive it was (and the fact that almost any aftermarket cooler is better than the stock Intel coolers), but after reading some benchmarks and reviews I saw that it was actually superior in cooling performance to my old Zalman heatsink. 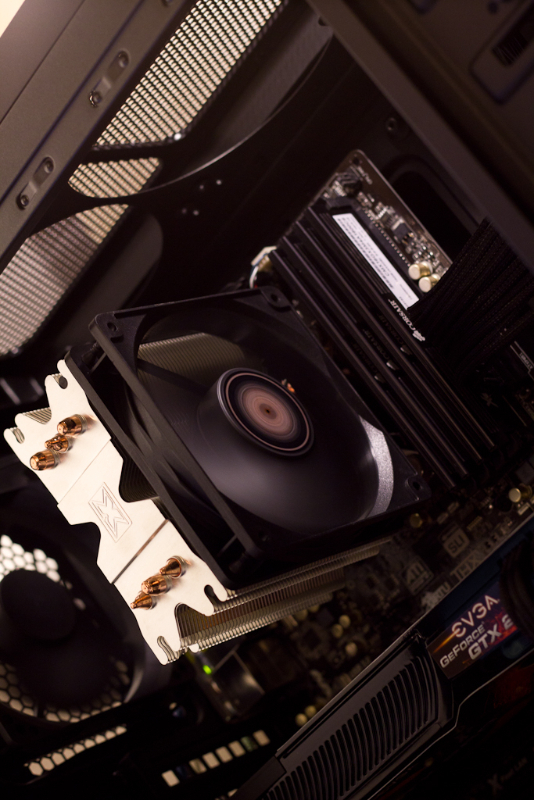 The Gaia’s included fan isn’t quite as silent as the Zalman with the fan speed controller, but as I sit here typing this article, I cannot hear its pleasant woosh over the rest of my system–even with the side of the case off and my tower less than 3 feet from me. I installed it with Arctic Silver 5 thermal paste and was very pleased with the results. Idle temperatures (27-30C/~86F) are only about 10-12C over my room temperature (18C/~65F). Under 100% load with Prime95 64-bit, several minutes of testing saw the core temperatures increase to 49-52C (~122F), or 30-34C(58F) above room temperature. The fan speed did not perceptibly increase, nor did the temperatures change when I put the side of the Corsair Carbide 500R back on. A cool, quiet, high-performance computer. Exactly what I wanted and what I needed. I noticed an immediate difference in the speed of my system. Between the additional RAM, high-end CPU, my SSD and the UEFI BIOS on my motherboard, I found myself at the Windows 7 log-in screen less than 10 seconds after pressing the power button. And I thought my previous system startup was fast. Apparently I might be able to cut that time down further by eliminating the Windows 7 loading animation, which has to complete one full cycle before it lets your system move onto the next step of booting Windows. After spending a day migrating my photos, music, movies, games and documents, then installing all of the software I use on a regular basis, I fired up Adobe Lightroom. Before, moving from one 28MB RAW image to another in Develop Mode would take about 8 seconds as it found the file, accessed it, and then rendered a working preview of the image. My new system took less than three seconds and, more importantly, the rest of my computer did not hang while processing and refining the image. The CPU is no longer the bottleneck as it was on my previous computer. It is now a joy to use my computer for photo editing–everything stays responsive and smooth. I have found that tone-mapping and other HDR processes are MUCH faster as well, taking a handful of seconds rather than closer to a minute to compile several RAW exposures into a finished 100-200MB TIFF file.